The Habit of Rainy Nights Press, 2003. Duane is an enrolled citizen of the Cherokee Nation (OK). His novel, Sweetland, is finished and going out to publishers and agents! He is hard at work on New America, the second novel of the Sweetland trilogy. 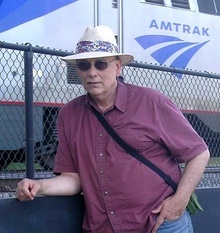 He is the author, with Patricia J. McLean, of Bartlett House, a Will Adelhardt/Lucy Hidalgo mystery. Online at http://bartlett-house.net, and he is co-editor of Raising Our Voices: An Anthology of Oregon Poets Against the War. Ursula K. LeGuin, Leslie Marmon Silko, Thomas King, José Saramago, Walter Mosely, Robert Charles Wilson, William Gibson, Doris Lessing, Neil Gaiman, Franz Kafka, etc. You must log in to write on Duane Poncy's wall.